Find and record music. Record all streaming services for music, audiobooks, movies, and TV shows. Convert all media for all devices. Audials One is equipped with one of the fastest streaming recorders. It is able to record individual tracks or even two playlists simultaneously at five times the speed from music streaming services such as Spotify in particular. 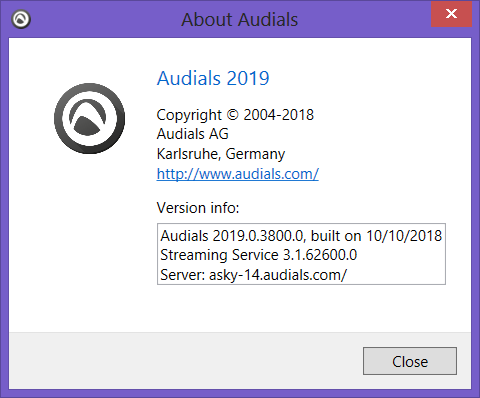 The new Audials One 2019 software is able to browse Spotify as an additional music source and then delivers the recordings in the best possible quality and the shortest time. Audials One 2019 is the only software to offer this world innovation. Audials One's streaming recorder is also a front-runner in recording movies. It makes use of a batch recorder and an automatic episode recording function to save entire seasons of series from the video streams of well-known services such as Amazon, Netflix and many others. Here, users also benefit from numerous improvements made to the new software. Particularly in the field of internet television, the new Audials One 2019 software offers 130 live TV streams from all over the world, which can be watched and recorded using the newly designed and convenient player. Audials One 2019 represents a paradigm shift, as the software is now operated according to the content and not to the function like before. The advantage of this is that users can now always immediately access all the functions when dealing with their songs, radios, movies and videos. 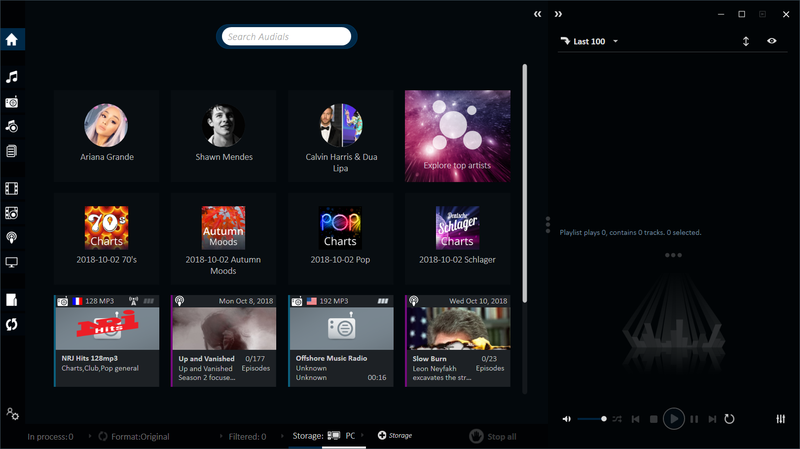 Thanks to the new so-called Styles function, users of Audials One 2019 can describe their own musical taste by entering in a few examples of artists or radios, and will then quickly receive vast amounts of fitting music from legal sources. Superiour/powerful desktop CPU (i5, i7, or comparable). With the unique Music Style feature, you can tell Audials all the styles of music you like - it's easy and amazingly precise. You simply have to type in sample artists. Audials will immediately come up with a great deal of suitable new radio stations! You can easily add your favourite radio stations to several Favourites lists and use them on Audials on your PC and the Audials apps. With Audials you can get a lot of music for free, legally and automatically within a short period of time. You choose or define one or more criteria and Audials records everything that your internet connection will allow. It's even possible to record several 100 stations at the same time! Podcasts are audio and video entertainment shows. With news, documentaries, reports, language courses, tests, trends and comedy, podcasts cover a very broad spectrum of entertainment. You can subscribe to them for free, and Audials will automatically download new episodes for you as soon as they are released. What is New in Audials One 2019? A lot of improvements have been made to our new Audials One 2019. You can now access and enjoy top-quality music, movies, series and internet TV faster and easier than ever before. Click on whatever you are interested in and simply scroll down. More music Quality For You! Spotify is now a search tool: Audials One 2019 now also searches Spotify for the music you want and delivers the highest possible quality of music at lightning speed! YouTube Reloaded: From now on, Audials will always find and use the best possible audio track for you to download directly from YouTube! New Mode: The most important video streaming services are preconfigured with a huge number of special streaming on all topics. Audials provides you with a new, generic recording mode. It allows you to make high-quality, unscaled recordings directly from the graphics card. This also works if the service uses adaptive streaming! This way you can save any video stream in top quality. Completely newly designed player for Internet TV. New, highly optimized live stream and media library video recorder. This allows you to save all content forever. In the navigation, click "Radio", navigate to the station you would like to record then start. That’s all! Which edition of Audials PC is the right one for you? Audials is a nice software. Thank you. Thanks for the giveaway, Tarek. This is a powerful package for recording streaming audio and video broadcast on official television and music channels on the web. I've completed everything in the rules and I hope I'm gonna win this software. I'm currently using the 2016 version, it's a great software and I think the 2019 is gonna be better. Wish me luck. Thanks Tarek for the opportunity to win this all-in-one software! Great review about this amazing streaming recorder, considered as one of the fastest. Its ability to browse Spotify as an additional music source and to deliver a best quality recording in a short possible time, are what set it apart from the competition. I'd love to win a license and upgrade my Audials Radiotracker 2018. Count me in! 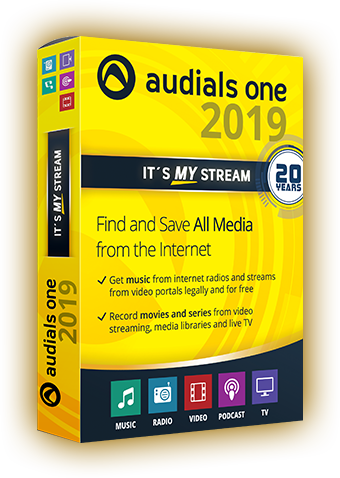 Audials One 2019 is a multifunctional program with which you can listen to radio online and search for any media content with the ability to save it on your computer. Current time: 04-19-2019 , 02:21 AM Powered By MyBB, © 2002-2019 MyBB Group.